16C11 Benjamin 5 BIGELOW, son of Benjamin 4 (Eleazer 3 , Joshua2, John1), and Mary (WYMAN) BIGELOW, was born circa 1750's, place and date unknown. With his parents he lived in Portsmouth, NH where he was in business (Howe gives a date of 1798). He was head-of-household until the 1810 census, after which we find no further record of him, and his widow Salome is listed as head-of-household in 1820, then no more. 1790 census: NH-Rockingnam-Portsmouth-Benjamin Bigelow: 1-l-2-0-0. 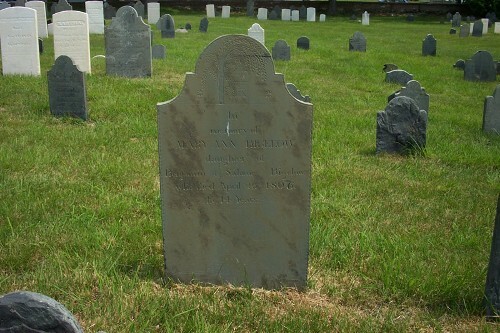 16C11.l James, bapt 30 Nov 1788 Portsmouth, NH. 16C11.3t Daniel Jackson, b ____ ; bapt 11 Mar 1792 Portsmouth, NH; d _____ ; newspaper issue of 1831 reports his death at age 40 in Portsmouth; m Adeline _____ . Adeline was admitted to the church at Portsmouth in 1832, and had 3 children bapt, but in 1850 she was living in Boston with her two sons, both single.